Hello, and welcome to the second weekly edition of Muscle Talk. This week we have already discussed the shoulder joint and muscles, as well their functions. Now of course in part two we get to focus on how to train those muscles so that they can grow strong, and in turn – big. Everyone loves training their shoulders – this is a given I believe. The level of effort is of course still very high, but it’s not the same as training our quads, or back for example. Those training days are the days that our head is down, eyes focused on the ground, knowing full well that each and every minute is going to be some of the toughest work that we have ever done. Shoulders by comparison are almost like the training equivalent of party time. They are fun to train, and look great when we get a good pump. Let’s look at a few ways that we can encourage our delts to morph into boulder sized bookends for our upper body. Of course one of the most obvious ways to train our shoulders is by either the seated military press, or seated dumbbell press. These are both tried and true delt builders, so I’m not going to argue with their time tested effectiveness. I am however, going to suggest that when training our shoulders it is most effective to not be using a bench that artificially stabilizes our shoulder blades as we press ourselves against it. This isn’t exactly cheating, but we aren’t getting the full benefit of the movement either. We may have to sacrifice some weight, but the benefits gained from standing when doing pressing movements are felt throughout the entire body, and is worth sacrificing our ego for. With that in mind, let’s begin with a few different pressing options, all of which are done while standing. The first one I’m going to use is my personal favorite all around shoulder, trap, upper back, and chest builder – the power clean and press. If done from the floor, there is an incredible amount of shoulder muscle used get the bar up to the clean position. Proper technique dictates that it’s an explosive hip thrust/shoulder shrug that is going to get the weight up. This is the first part of the clean and press that uses our entire shoulder region, as well as entire body, to heave the weight from the floor up to our shoulders. From there, I use a push press to get the weight overhead. This is still part of the clean and press, but can be used on its own as well. The trick to this is to thrust through your legs to generate the force necessary to get the heavy weight over head, and once there squeeze your traps and shoulders as you bring the weight up and back so it is balanced directly over the crown of your head. 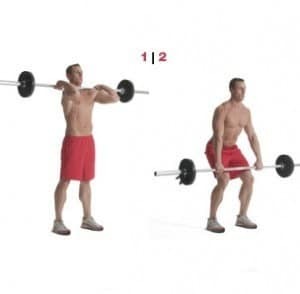 By doing so, you will engage all three heads of the shoulder, as opposed to a straight up and down ‘front’ push press. standing one arm barbell overhead push. The standing barbell press is a great way to build our front and side delts, the muscles in our rotator, as well as the traps, and the serratus anterior. It also involves a heavy amount of core due to the stability required. This is not the same as a push press, as there is no momentum generated from the legs. As such it is more of a true shoulder exercise. It also activates the core much differently as the transfer of power is more controlled. Try both methods to feel the difference. The one arm barbell overhead push is another one of my personal favorites. I just did several sets this morning as a matter of fact. You simply need to find a quiet corner – literally – of the gym so you can lay a barbell into it at a 45 degree angle. Load the end of the bar that is not in the corner, and from there grip it with one hand at your shoulder while facing the corner, with the loaded bar leaning back on your shoulder. Bend your knees slightly, and think of this move as being explosive from the hips, and the press portion is almost like a punch motion. Use your alternate hand to counter the motion and maintain balance. This exercise is great for your core muscles as well, as they will be heavily relied upon to maintain a rigid torso, and to transfer power to the limbs during the explosive phase of the movement, as well as the negative ‘catch’ phase. 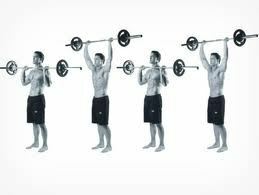 Another great all around shoulder exercise is the upright row. The reason being that all three delt heads, as well as the trapezius, are all effectively targeted during different portions of the pull and subsequent contraction. As such it allows for even growth of these muscles, which is of tremendous benefit to our posture. Muscle balance is key to proper posture, and proper posture is key to maximal development. As always, our body may be comprised of many muscle groups, but it sees itself as a whole. Our training should always have an element of focus directed at addressing the body as if it were one continuous muscle. All of these exercises have been either full body exercises, or exercises that focus on the entire shoulder, and upper back/chest area. There are of course isolation exercises that can also be used to develop the deltoid heads further. The front, side and rear lateral raise are all great at targeting the individual delt heads. I personally don’t focus much on such exercises, but when I do I like to use them for pre-exhaustion. If, for example, your rear delts are lagging behind your front and side delts, a set of rear delt raises completed immediately before overhead presses, or upright rows is a great way to take that particular muscle head well past failure. 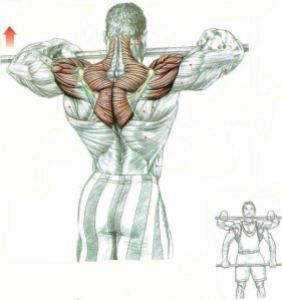 This is due to the other muscles contribution during the compound lift assisting the exhausted muscle, allowing the rear delt head to keep working well past it’s normal capacity. In this manner, isolating your delt heads can be an especially effective technique that can lead to better overall balance. There are many exercises that are great for strengthening the extremely important rotator cuff muscles – but all are too complicated to explain effectively. That is why we are rushing as quickly as possible to get video up here. It won’t be long now, but I for one feel that I owe it to you to do the best job that is possible in order to keep up the high standard I’d like to think you have come to expect at this site. We do sincerely try to bring you the best of everything, whether that is information, recipes, or products that we have found great deals on (sale on all protein powder plus $10 off coupon when ordered through this address btw). That’s what I want you to expect from FitnessVolt.com, and why I’m not just throwing together some video in order to get it up in a hurry. Tomorrow is another day however, and the day that just so happens to be devoted to Fat Loss. 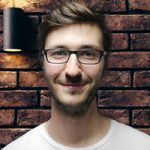 The Fat Loss Facts series will of course continue, and I’m really enjoying the enthusiasm everyone is showing with their fat loss efforts in part because of these posts. If you are into fat loss, or are considering it, make sure you drop in tomorrow to say hello, OK?